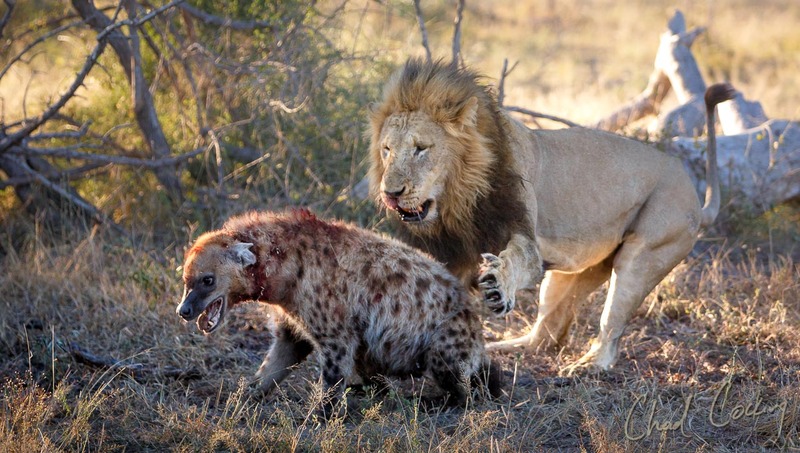 Not many people would guess that hyenas would be able to dominate lions in an area, but as is often the case, these mostly misunderstood predators are hugely underrated. Given their complex social organisations and the fact that their clans regularly number twenty five or more members, their dominance in such systems should not come as such a surprise. Over the last couple of years, aided by the drought of 2015/6, the hyena population in the Timbavati surrounding Tanda Tula Safari Camp became, without doubt, the dominant predatory force in the area. Leopards struggled to keep their kills, as before they could hoist them to the safety of the trees, the hyenas had run in and displaced them. Despite their cooperation, the wild dog packs also lost many a meal (and even a pack member) to the hyena clans. 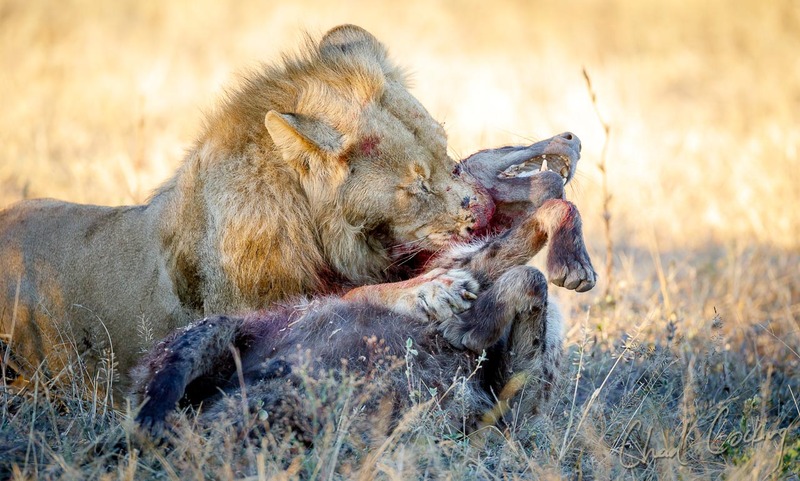 Not even the lions in this part of the Greater Kruger National Park were safe from the hyenas, and they made the last of the Machaton pride’s lioness' life a complete misery by stealing almost all of the kills that she managed to make. The hyenas dominated, and that was that. But times they are a changing……. 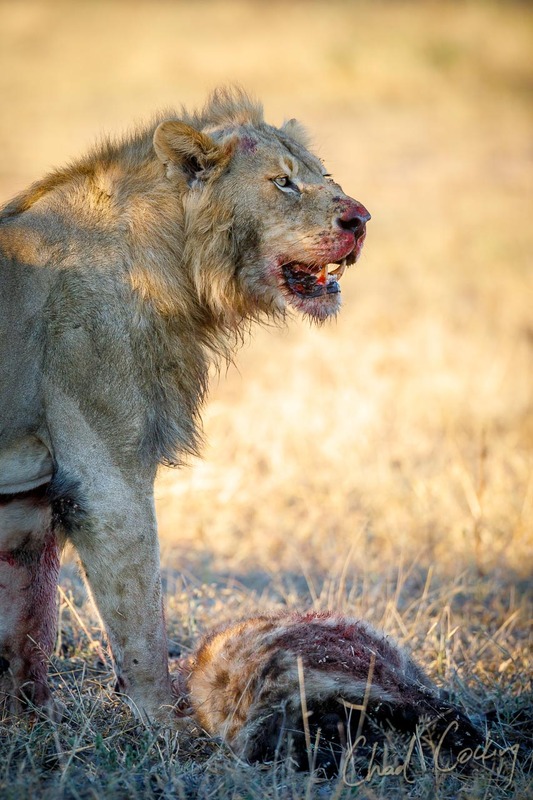 There has been a slow power shift in the central Timbavati over the last while, and it appears that the balance has eventually tilted back in favour of the lions. Whilst still young and not yet in their prime, the two Mbiri male lions are starting to stamp their authority on the area in a big way. With two prides under their control, the Mbiri and two Ross females, they are covering large territories on their nightly patrols, and besides siring the latest offspring in the reserve, they are huge contributors to taking back control of the area from the hyena clans. 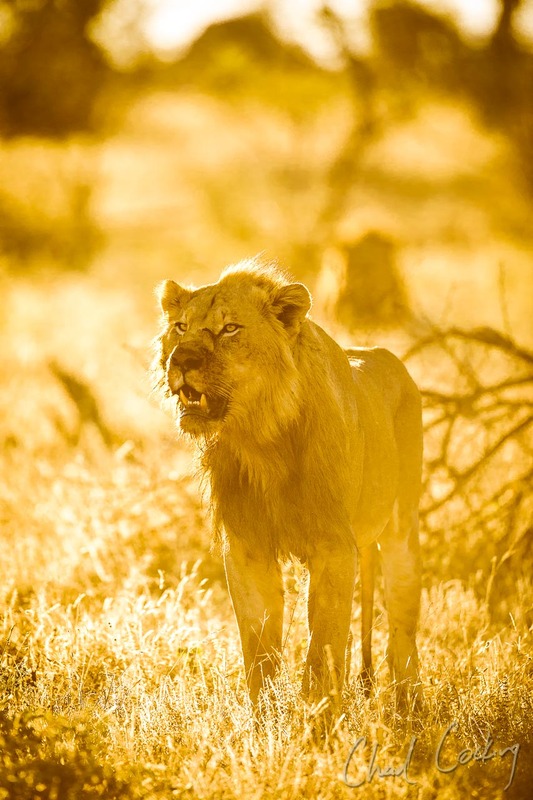 We had the most unbelievable sighting a few days ago, proving just how formidable these lions are. Prior to departing for morning safari, we could hear the two Mbiri males roaring out towards our western boundary. When they were found, they seemed to be on a big mission, running to the west. With two packs of wild dogs having a fight, the guides assumed that this was what had drawn their attention, but they passed the wild dogs and carried on towards the sound of some hyenas; their eternal enemies. The next update that we received was that the lions had caught a hyena, and one can only imagine the racket that would have been going on at that moment as hyena clan members weighed up the odds of successfully assisting their clan member versus becoming another victim. 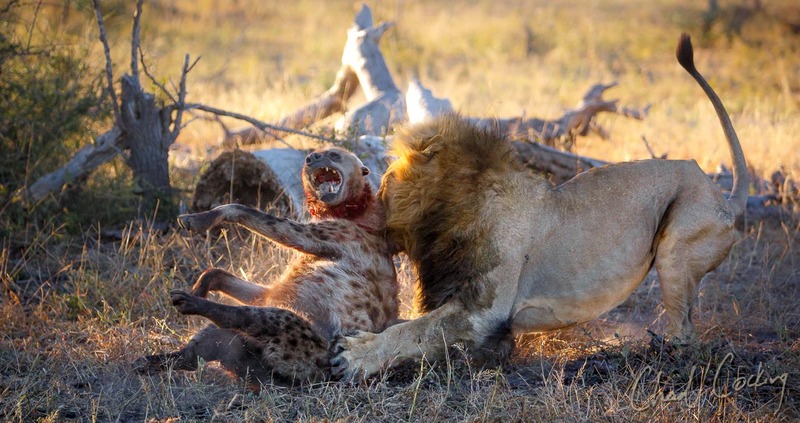 This was not the first hyena to fall victim to the lions in recent times. 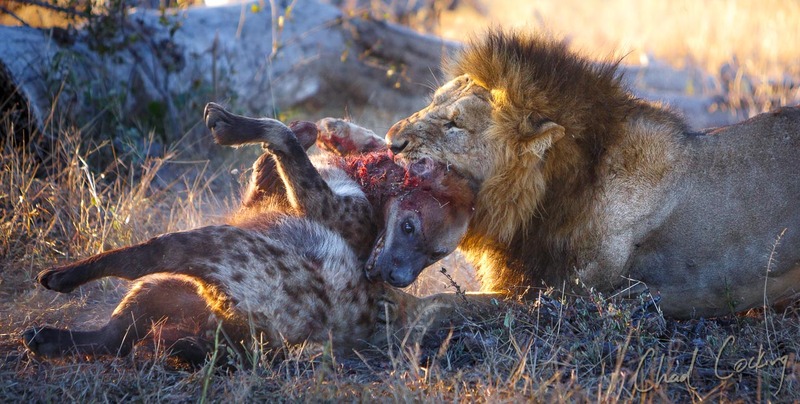 We arrived on the scene a few minutes later as the younger male lay with the hyena firmly clamped in its jaws. 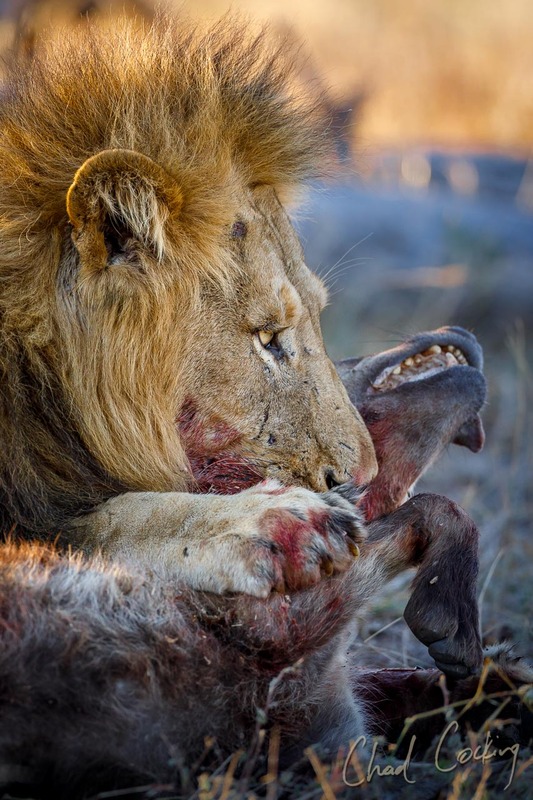 Our first instinct was that it was dead, but when, after a few minutes, the male lion stood up and walked away, we could see that the poor hyena was still breathing. We followed the young male lion as he walked off, but he wasn’t stopping for anything, so we returned to view the bigger male who had, until now, just been resting nearby. Slowly, the lion got up from his position and inquisitively walked over to the hyena, but as he approached, the hyena sat up, much to my surprise as I had assumed this wounded animal was paralysed. The injured hyena sat there whimpering and squealing, but to no avail. The big male lion instinctively lashed out with his enormous paws and pulled the hyena towards himself, grabbing hold of its bleeding throat and clamping down with his powerful jaws. Suddenly the squealing stopped, the lion held on for a good couple of minutes before finally releasing his grip. Then the king of the beasts rose back up and casually walked off as if it was just another Friday morning. It was not the easiest sighting I have ever had to watch, but it was one of the rarer moments I have been privileged to observe out in the African bush. 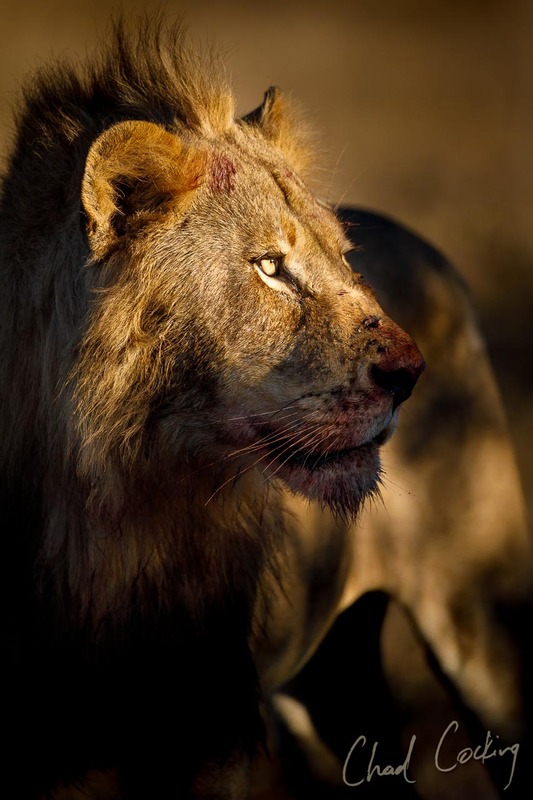 Death is never an easy event to bear witness to, but as the lions sauntered off, there was no malice in his demeanour, and no pleasure had been taken from his actions. It was purely the physical enactment of what nature has sculpted into his DNA. Lions and hyenas do not get on. They never have. They never will. They will always be eternal enemies.